Quinns: Alright. We’ve got yet more Kickstarters in the news this week. What can I say? The news is primarily a place for new game announcements, and Kickstarters are basically that but with more information and better art assets. 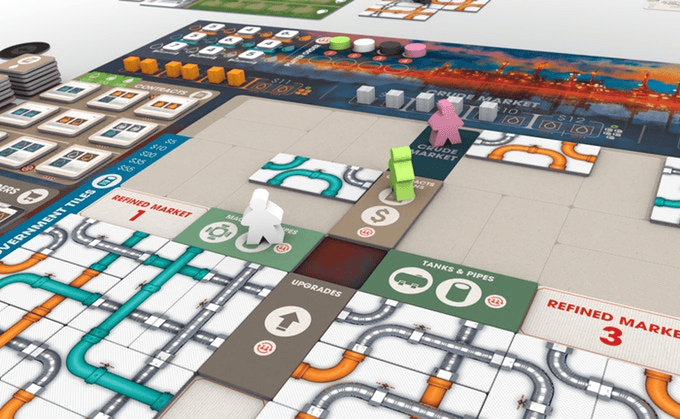 Players in Pipeline represent oil companies, buying crude oil, machinery, and the amusingly-titled “Government Pipe” and “Personal Pipe”. Up to this point, the game resembles an ordinary engine-building game. However, players can also take an action to (ahem) use their personal pipe, at which point the teal, orange or grey oil barrels in your possession can become refined according to the corresponding length of pipe in the knot of personal pipe that you’ve constructed. I think it sounds inventive and awesome. I can’t wait. Matt: Pipe Mania is possibly my favourite thing, this looks so up my street that it’s inside my kitchen and getting oil on the cupboards. Now, who likes pens and pencils? I’ve got some NEWS FOR YOU(S). 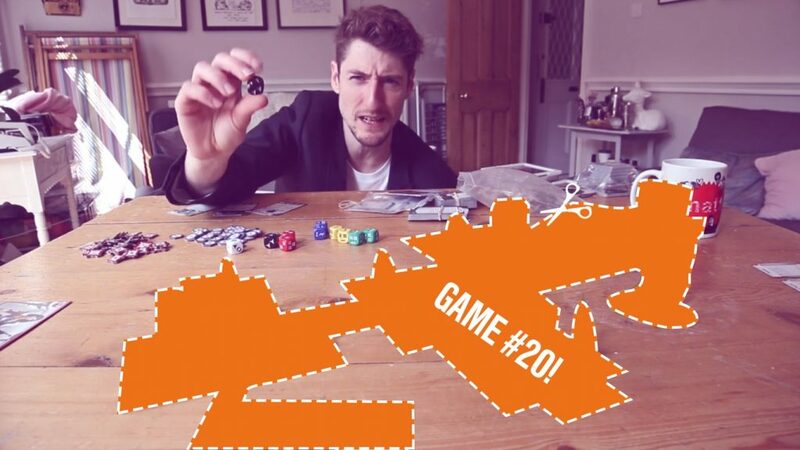 Fuelled by the frankly far-fetched idea of an amusement park that is filled with dinosaurs, Roland Write has done it again – cranking out yet another game in which players simultaneously use pen and paper to fill in their sheet using shared dice rolls. The prolific designer’s latest work is Welcome to Dino World, and has you filling up a map with dinosaur enclosures, as well as the carefully-placed generators required to keep them powered. It would seem remiss not to play in Danger Mode – a variant of Dino World in which carnivores get tetchy, and players have to account for a power outage phase. We’ve no frame of reference as to what could go wrong should the power in your dinosaur park go offline, but I expect the resulting paperwork might be awful. Quinns: We’ve not played Claustrophobia, but my understanding is that it answers the question “What if Space Hulk actually worked?” Better yet, Claustrophobia is now coming back in a new edition with the kind of Kickstarter I can get behind– no stretch goals, no false economies, just a game that’s already manufactured and being delivered in January. Matt: OH MY GOSH what if Space Hulk actually worked?! I love the idea of that beyond belief. Did you ever play Battle Isle Phase Four: Incubation? Quinns: Is that a real game? Matt: I wouldn’t make up fictional videogames at this time on a Monday morning. Anyway, it was wild and weird and deeply Space-Hulky, which I think was why I put so much energy into loving it. Quinns: Oh no, gosh, I had this videogame when I was tiny. I can actually quote the opening (sexist) cutscene from memory. Matt: It had its own theme song, I still remember it vividly. I think it’s one of the worst things ever recorded – the 1990s were absolutely fantastic. Quinns: Oh no, I shouldn’t have clicked on that link. How about you and I just agree that when Claustrophobia 1643 comes out, we immediately make some time to play it? Matt: OK fine, I think that counts as therapy. Talking of nostalgia, who remembers our playthrough of Catacombs?! I remember catacombs because I bought a copy of it fairly recently – it honestly isn’t that old of a game. The third edition Kickstarter proudly offers “an irresistibly smooth and consistent flicking experience”, which caused me to spray hot coffee across most of the walls of the SU&SD newsroom. The big selling point here is playmats, which replace the fold-out cardboard versions of the game’s levels, which seems neat! As much as I love Catacombs, setting it up is a lot faff, so anything that makes setup a bit quicker (or more entertaining) sounds marvellous, and I’m interested to see how the textural change affects the overall feel of play. 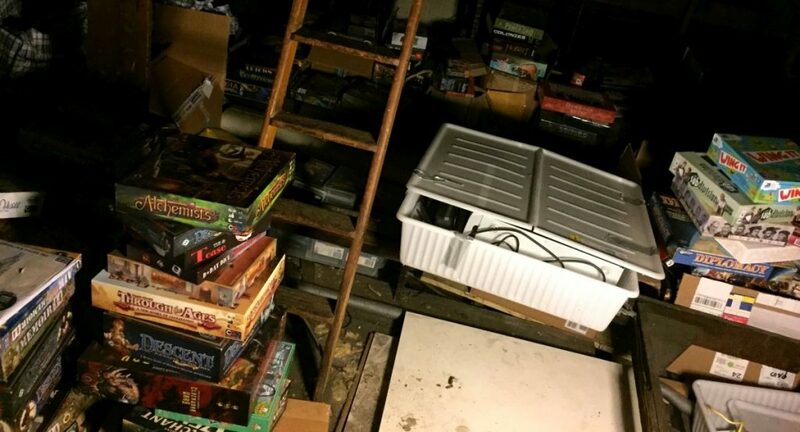 Having said that, as much as I love the weird mashup of dungeons & dexterity that is Catacombs, it isn’t something that frequently finds its way onto my table: a bigger box with more stuff isn’t quite the proposition I’d want for this game – in the land of The Man With Tiny Cupboards, it leaves it (weirdly) competing with stuff like Imperial Assault or Gloomhaven, like a gaunt, confused boxer that somehow got misplaced into the super-heavyweight class. But that’s just me – your mileage will vary! Quinns: You’re speaking to a man who owns a copy of Catacombs first edition. That box is tiny, weird, hideous, and I love it to bits. Matt: I think there’s something to be said for that, you know? Catacombs is now a big box that hasn’t seen the experience it offers scale alongside that. But I’m getting fairly abstract here, so let’s shuffle on. Shall we discuss the disgusting all-you-can-eat worker placement game, Scoffton? Quinns: Actually, for balance, we should probably link to a more serious crowdfunding-related story. 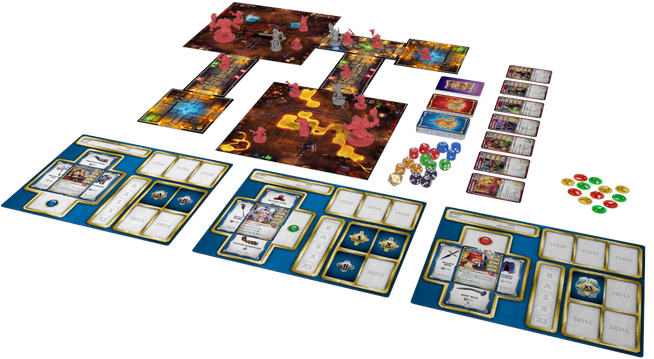 A Kickstarted board game from 2015 that raised $1.29 million (minus Kickstarter fees), Super Dungeon: Legends, has recently revealed that to actually deliver the game, they’d need another $750,000. In other words, the game’s 6,600 backers may never receive the game. Matt: My face is literally now doing “the shocked emoji”. Quinns: This story was actually emailed to us by a SU&SD reader who said that he’d backed ninety nine Kickstarter campaigns, and though this is the first to have failed, he now thinks he’s “done” with the platform. That’s perhaps unsurprising when you see that most backers of Super Dungeon: Legends invested $200 plus shipping. Matt: As our audience must know by now, we’ve been wary of Kickstarter for a long time – it’s perfect for our job of covering the news of upcoming games, but in terms of being a place where people buy stuff? You’ve got experienced high-end companies using the platform as a shop, where you’ll definitely get your stuff at some point (even if it doesn’t end up being all that good), and then people going through the same *motions* as those guys, but stumbling when it comes to actually producing it. I think it’s totally cool that Kickstarter doesn’t offer refunds – it was designed as a platform for supporting ideas. But now that we treat it as a shop, it’s beginning to feel like it’s just a very *bad* shop, one that demands frequently-shocking quantities of money for games that might be bad or might not even actually arrive, all the while with basically zero consumer rights. At this point, I’m just surprised that so much of the board game community seems to fully embrace it. Quinns: It’s a good point, but I don’t see the community as having much of a choice. 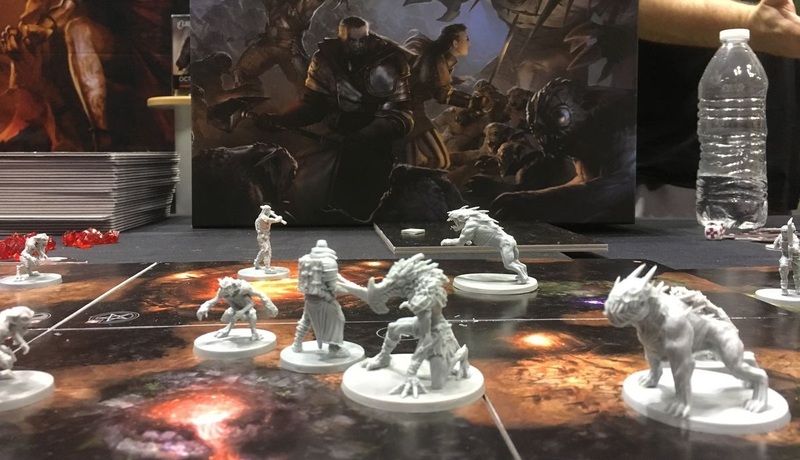 Board game fans want to get excited about what cool games are coming next, and outside of Kickstarter, board game publishers frequently do a terrible job of getting people hyped for what they’re working on. I can’t even find decent pictures for the Games News half the time, let alone press kits. 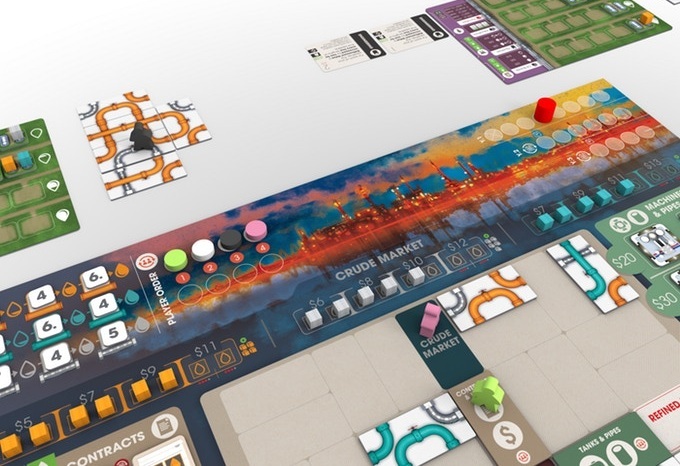 Until such a time that the industry gets better at PR and marketing, board game fans are going to flock to Kickstarter when they want to get excited, and that’s going to involve pre-purchasing those games. Matt: And then getting mildly miffed when the eventual reviews say those games aren’t wonderful?